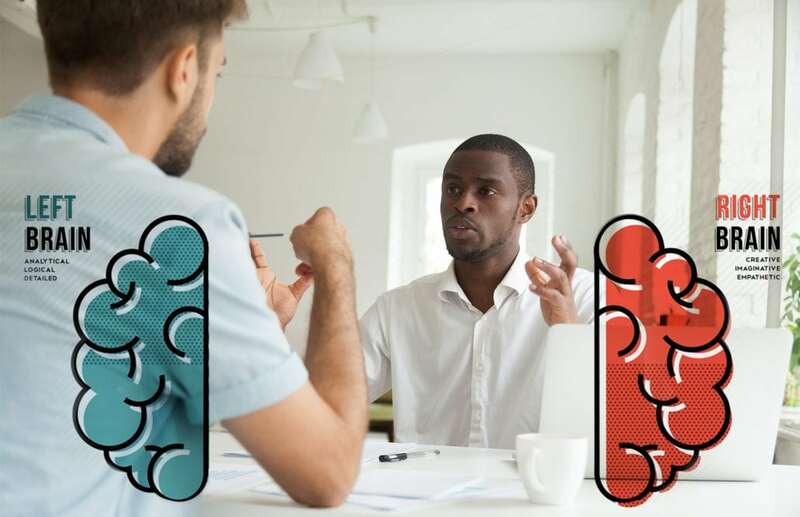 To save a lot of time, headache, and back-and-forth “Who’s on first?” communication…go through these steps to anticipate your creative contractor’s needs and get the product you ultimately want much faster. Brainstorm, Brainstorm, Brainstorm. Creatives love to brainstorm, so if you can afford to spend a little more of your valuable time explaining your desired result, you’ll probably cut the production time for your piece down quite a bit. Give the creative professional value and meaning of what you are trying to achieve with the project up front. The left side of the brain processes information from part to whole. It takes the pieces, lines them up in a logical order, and then it draws conclusions. The right brain, however, processes from whole to parts. It starts with the answer; it sees the big picture first, not the details. Creative minds tend to either go a mile a minute or reversely get extremely focused. Providing more detail will reign us in and keep us on track with your ideas. The Creative’s first thought might be how your marketing might look to them and they’ll head off running. If you have specific brand guidelines, images, etc. please provide them and we’ll stay focused on the track you’ve provided. Once a graphic designer gets started on your project, it’s common for their creative minds to journey to undiscovered tangents for the purpose of providing you with innovative ideas that may be new to your market. To keep expectations clear for all parties, make deadlines specific from the beginning. Designers thrive on deadlines; and because they have a tendency toward aesthetic perfectionism, they usually spend nearly all of the time allotted. Don’t forget to respond in a timely manner when working with creative people. Most often they are in the middle of working on something when they ask you a question; and almost always that means that they are deep within your project and focused on inventive ideas. If you catch them long after their inquiry, they may be off and running with another project and their mind will have moved on from yours. Understanding the artist’s process will in turn help you get the best final image possible. An experienced creative professional knows that your ideas are more important than theirs. It is their job to see the highest value in your ideas and question when they do not understand. As a creative, if we are going to present you with ideas in addition to the guidelines you provided, we should be aware that they may not fly and should be open to you sticking to your original idea. However, it may be totally worth your while to adopt the “you may not know what you don’t know” attitude. Our expertise may present you with ideas that have not been explored, and for you to accept them may create the best outcome for the customer and yourself. Once you’ve provided a creative with your project, give them the space to develop and present a draft to you. Nothing stifles creativity more than waiting and watching. Creatives work best when flexible with time and environmental influences. If you are counting on the help of a designer to support your marketing efforts, it will benefit you to remember that opposite thinking styles can work together very well and that the outcome can sometimes be magnificent. Contact Utah Media Group today to learn more about using our graphic designers for your company’s creative needs.